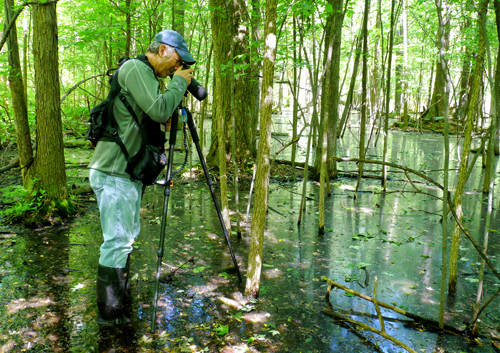 I had the opportunity last week to go photograph with Mike Moats, a professional photographer who uses Tamron lenses. We both gravitate towards close-up photography and got some amazing shots walking around a brown, plant-less arboretum in Minnesota. Here in Minnesota we have not seen a lot of snow yet. I was inspired by the transition into winter. A brown normally uninteresting landscape becomes a focus of what once was. The remnants of fall colors and full ponds now covered with ice; the last leaf hanging on the branch. This first photo (where I got this theme) is a wood covered bridge. You'll notice the shade still has snow, but the sun in some areas melted it away. Then we focused on the pond. Mike showed me how he photographed the leaves frozen in the water; which ones to look for, how to see texture within the ice. Overall I started the day not expecting anything interesting to photograph. I left the day inspired and with a handful of amazing images. If you like old rusting cars and trucks you will be in paradise if you visit Old Car City. Located about 50 miles north of Atlanta, and just two miles off I-75, Old Car City is the largest collection of classic cars in the world. Over 4,000 cars are scattered throughout acres and acres of woodlands. It is one of the most interesting places I've had the opportunity to shoot at. This is not your typical junkyard with most of the parts of the cars missing, the majority of the old cars are fully intact. The owner welcomes photographers and the entry fee is $15 for the day. I used my Tamron SP 70-300 VC and my Tamron SP 90mm macro. 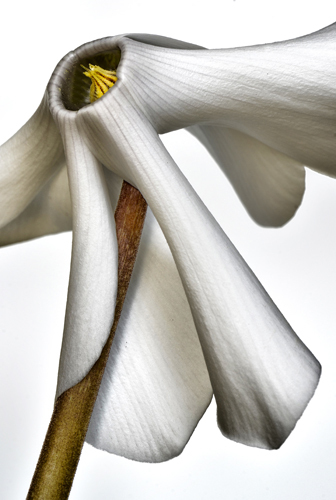 For Macro Workshops visit my website at www.tinylandscapes.com. 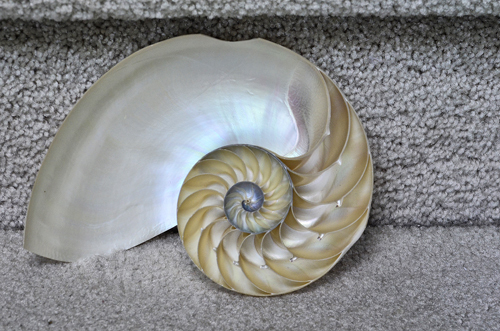 As a pro macro photographer I have always concentrated on photographing nature. Many times during the four seasons we have slow periods when subject matter in nature isn't as available, so that is the time I spend looking for new close-up/macro opportunities. Close to my home in southeast Michigan we have an amazing attraction called the Henry Ford Museum. It is home to a massive historic collection of antique and unique automobiles, trains, planes, machinery, farm equipment, furniture, clocks, carriages, firearms, and more. Most of the subjects are behind ropes and barriers, so a longer lens is needed. I used my Tamron SP 70-300mm VC USD lens which worked prefect. The 300mm reached out when needed and I was always far enough away and never inside of the minimum focusing distance of the lens. I could fill the frame with small areas of the subjects and easily zoom in and out to frame the composition. We are not in the macro range with these images but in what we call close-up photography capturing small areas of a large subject. Here are some of the images from the museum. I will be offering some workshops at the museum in the future. I did some test to see exactly how tight of a shot I could get with my Tamron 17-35 wide angle zoom and my Tamron 70-300 telephoto zoom. Both lenses are just regular lenses, and not listed having any macro capabilities. I compared the two zooms to my Tamron SP 90mm 1:1 macro. 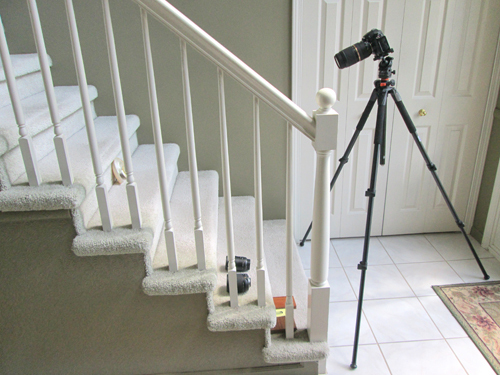 Here is the set up with the 70-300. the minimum focusing distance was 44 inches. If I move in any closer then 44 inches, it won't focus. This is the shot with the 70-300 and as tight as I can shoot on this shell. The area that I was able to capture was about 7"x10". So not too bad, and it diffidently could be used for some larger subjects in close-up photography. My 17-35 wide angle lens was able get me tighter on the subject at it's minimum focusing distance. In order to get this shot I had to move in really close with the 17-35 lens, and the minimum focusing distance was about five inches from the front of the lens to the subject. So you can do some fairly tight close-up photography with this lens but you will have to work in very close to the subject to do it. Now I tried it with my 90mm macro, and I reached the minimum focusing distance when the front of the lens was about six inches from the subject. Now look how tight of a shot I have. It measured at 7/8th of an inch by 1 and 3/8th of an inch. Pretty tiny area. Here is the minimum focusing distance with the 90mm macro lens. So if you have a wide angle lens you will be able to do some fairly tight close-up images, and if your shooting larger subjects or covering a larger area, you could get by with the 70-300 in a pinch. But for the true macro work you need that macro lens. It’s a very exciting time in Colorado. The wildflowers are starting to bloom all over Colorado and the neighboring states. Every year this slow and colorful parade starts low in elevation and progresses to higher altitudes as the spring turns to summer. 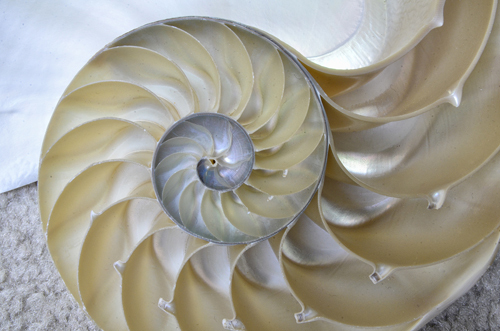 It’s a dream macro playground for both macro enthusiasts and nature photographic professionals! 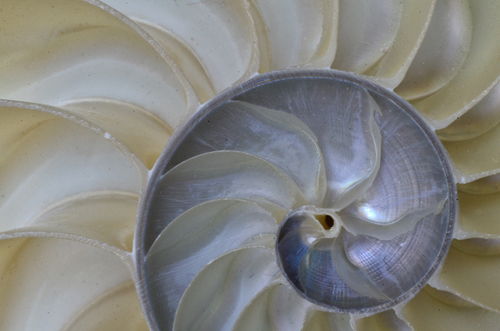 If you don’t yet have a macro lens in your tool kit, this is the time of year to consider adding one. Whether it’s in your own garden or in my backyard, The Rocky Mountains, macro lenses offer you a great opportunity to adventure into a world within a world. 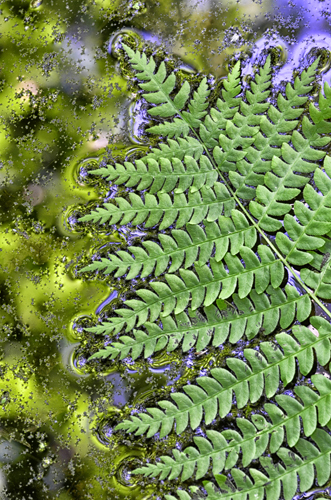 In fact, you can find fascinating macro landscapes no matter where you live. They are all around us. 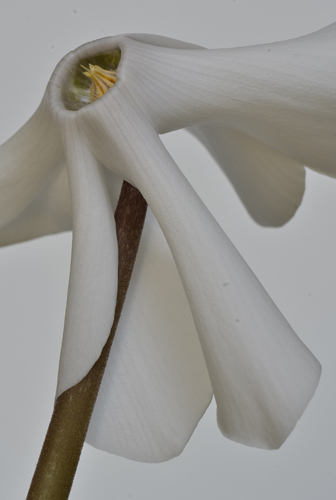 Below I have included wildflower images taken with the Tamron SP 60mm f/2.0 1:1 Macro lens. I love the way you can use very selective depth of field with this lens. Using F/stops like f/2.8 and f/2.0, I can bring unique focus to the subject while at the same time rendering the flowers in the background out of focus with less depth of field. I use f/stops like f/4 and higher if I desire greater depth of field or a more in focus background. I find photographing wildflowers to be incredibly relaxing and rewarding. You see great images of wildflowers all around you from the magazines you read to the websites and offices you visit. If you own your own DSLR, why not make this the year you create your own masterpiece to frame and put on the wall or post on the web? With a macro lens and a little practice, I know you could do it! Please be careful when photographing wildflowers not to step on or damage the surrounding growth. 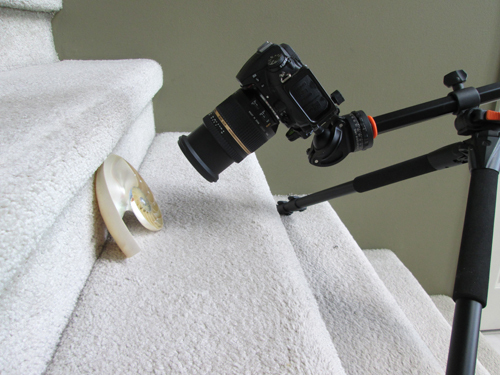 A good quality tripod and the proper remote or cable release can make avoiding plant damage and macro photographing much easier. It’s likely that you will encounter wet areas as you look for freshly blooming wildflowers. Some form of pad(s) for your knees, elbows and hands comes in handy as you will find yourself resting on all four in back of the tripod for long periods. Practicing with your new macro lens and a tripod in the backyard can be very beneficial before that big vacation wildflower shoot. Whether it’s in your state or mine, I hope to see you along the trail. I call it my swamp, but it's really a vernal pond. A vernal pond is a body of water in a low area of the woods where the spring snow melts and the spring rains collect from higher ground. The ground is a hard compacted base, so the water doesn't seep into the earth, it has to evaporate for the pond to dry up. It will take months to dry up, and if we have a rainy summer it will stay wet all year. I use knee high boots to navigate the perimeter of the pond. I usually use my Tamron SP 180mm macro lens to give me a little reach for floating leaves and frogs, but today I decided I would try something different. I decided I would take my Tamron SP 70-300 VC lens and see how well it would work for this type of close-up photography. I'm not working close to the subjects or anywhere near the traditional macro ranges so this lens could be a good choice. I was surprised how well the SP 70-300 worked and the minimum focusing distance never came into play as I was a good distance away from all my subjects. This lens with my crop sensor gave me a reach of 450mm, which is really nice for reaching out. This was really the first time I put the 70-300 to use, as I only concentrate on macro subjects, using my macro lenses. I was very impressed with the sharp images it produced. This looks like it will be my go to lens for the ponds shots. 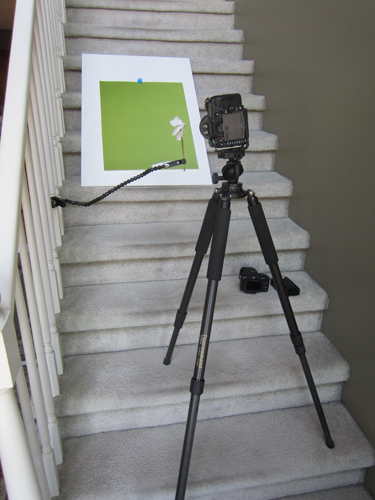 Here I'm set up to shoot my first floating leaf. 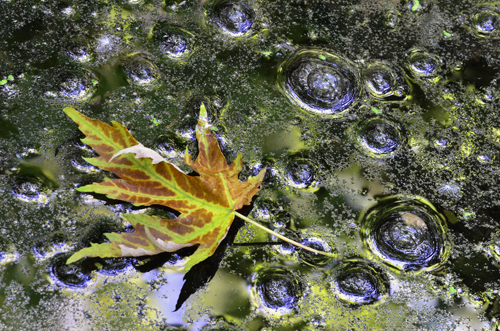 This morning there is a lot of tiny debris on the water which adds some nice textures around the leaves. 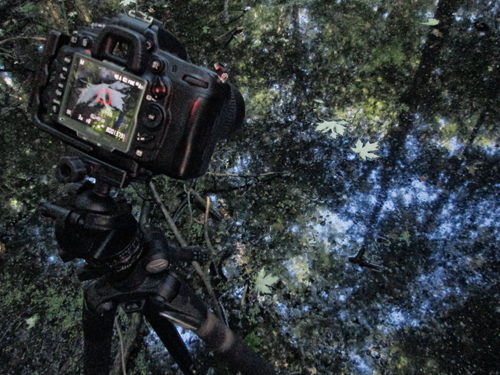 Because the pond is right in the middle of the woods, and full of trees, I will get some nice reflections from the leaves overhead. The yellow color is the reflections from the leaves at the tops of the trees, that are being lit by the sun, turning them from green to a yellow. 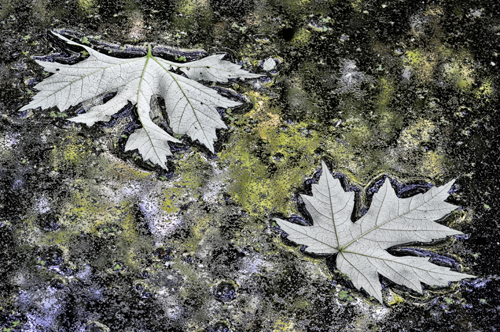 The "Detail Extractor" in Nik Software is the perfect filter to pull out all the textures in the water and the leaf. Here is the same leaf with a second leaf included in the frame. As I change angles the colors in the water also changes. I occasionally run across a leaf floating that has turned into a fall color, so many times I shoot these and people think they were shot in the fall. I decided to use this leaf in a set-up. When I walk through the pond it produces bubbles where I walk. 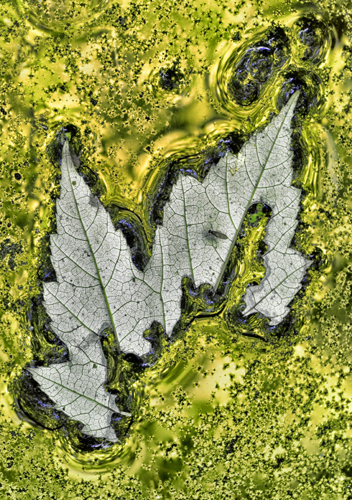 I created some bubbles and placed this leaf in the bubbles. Moved back and set-up the shot. 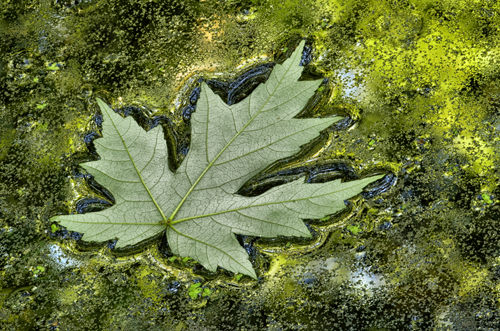 This leaf has a nice artistic design, and top it off with the textures and bright color in the water. Lots of ferns border the edge of the pond, so I thought it might be a unique shot if I place a fern on the colorful water. Some orchids can be very complex flowers with curving lines overlapping one another and colors galore. 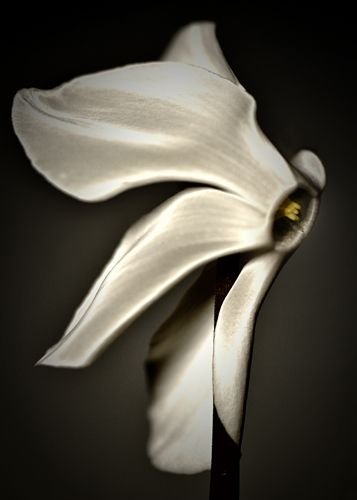 Having so much to work with, in such a small flower, sometimes it can be difficult to find a point of focus. So I am going to keep this blog nice and short with a simple technique I use to keep myself from getting frustrated. We all go through periods where we look at something we want to photograph but just don't know where to start. 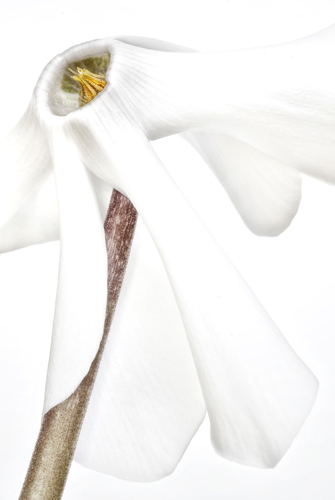 When I have a tough time finding an interesting image with the more complex orchids, I turn to the very simple ones. A perfect example is the image above, what caught my eye was the perfect curve of the fuzzy stem leading to the slightly opened bud which revealed just a little bit of pink color. That's it, nothing more, so I framed the flower nice and tight accentuating the curve and size of the bud. I captured this image using Tamron's SP 180mm 1:1 Macro lens with the following settings: ISO 400, F/32 at a 1/2 sec. shutter speed. This was shot in one of Parkside Orchids (Ottsville, PA) greenhouses, so the sunlight was nicely diffused by its translucent roof. I placed a yellow piece of craft paper about 24" behind the flower to add some color and a white panel reflector to bring in a touch more light. A little while back I was capturing some images for a macro photography seminar and I was thinking of some different ways to light my subjects, which in this case was a variety of flowers. At first I headed outside with a diffusion panel and some reflectors to work with the natural sunlight. Then I headed back inside to work with some nice soft window light, using sheer curtains as a diffuser. After capturing some nice traditionally lit images I decided to change things up a bit and started to capture some images by painting with light, using an old maglite flashlight in a completely dark studio. The image above was captured by painting with light, but with a small twist. Photography is defined as "Drawing with Light" and in this image that is a literal definition, I used a maglite flashlight as my sole light source and "drew" the light where I wanted it. First, with the lights on I set up my subject (the flower) on a black background sweep, I set up my camera on a tripod and framed then focused the camera on the flower. I then set my camera using the Tamron 180mm 1:1 Macro lens to F/22 with a shutter speed of 30 seconds and an ISO of 200. Next I turned off all the lights, with flashlight in hand so I could see what I was doing. I fired the cameras shutter using a release cable (to prevent camera shake). Once the shutter was released I started to paint/draw the flower with light, continuously moving the light across the flower. Making sure not to stop in one spot for too long which would cause a hot spot in the final image. My first few shots were taken by painting the light only on the front of the flower, which looked nice, but wasn't what I was looking for. The small twist with this image was that for most of the 30 second exposure I was backlighting the flower to make it glow and only about 5 seconds of painting of light on the front red center of the flower to make sure I get some detail there as well. 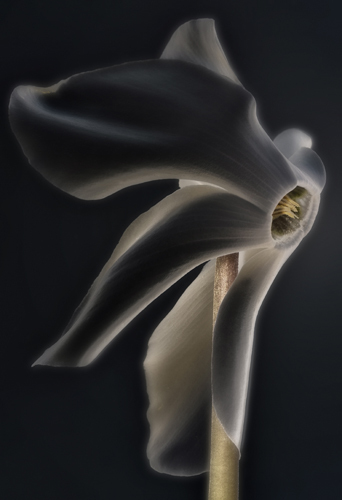 This is a fun way to capture some really unique looking images of flowers, just remember there will be some trial and error to getting the correct setting on your camera and how and where you want the light on your subject. It doesn't matter where you are in the United States this year, one thing seems pretty certain, 2012 will not be remembered for a harsh winter. I was out in Colorado a few weeks ago and even in the mountains you could see the grass poking through the lack of snow. Last weekend, in the Catskill Mountains there was finally a day that looked and felt like winter and to celebrate this glorious occasion my fiancée and I hiked up Slide Mountain. It wasn't until the sun briefly managed to break through the clouds that I noticed that all the trees were completely encased in ice, making it truly a "Winter Wonderland." Halfway up the mountain we came across this easily accessible subject and took turns looking for compositions with the Tamron SP 60mm F/2 Macro. Inherently, macro lenses have less depth of field at closest focus especially at wider open apertures. This makes focus critical but also allows you to select a specific point of interest. It's funny that the images seem to convey calmness, which completely does not depict the reality of the windy conditions and snowfall that was actually occurring at the time of capture. Anyone that has macro experience knows that when even a slight breeze can blur your subject, high winds and snow would make it a bit more challenging. When I downloaded the images I noticed that these two looked great together because they had a similar rhythm even though they were from different perspectives and decided to create a diptych. Often the placement of images next to each other can change the meaning or the mood. In this case, the curves of the individual images become more lyrical and accented, more like music instead of merely notes. And that is my brief and tiny bit of winter. 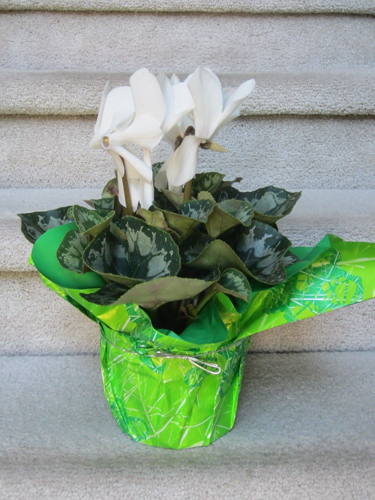 Yesterday I headed to a local florist and picked up a couple pots of Cyclamen flowers. Very nice designed flower but can be difficult to find a nice comp sometimes. 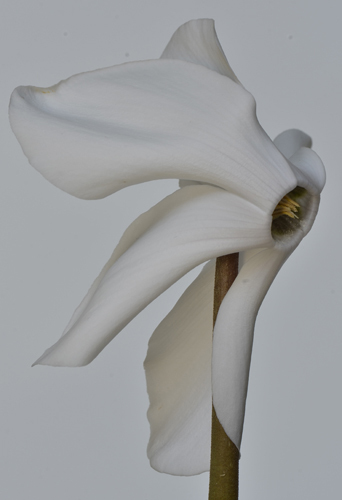 Here is the pot of white Cyclamens I was working with. 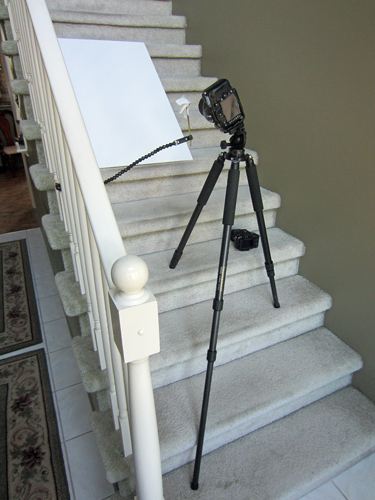 Here is my setup to shoot. 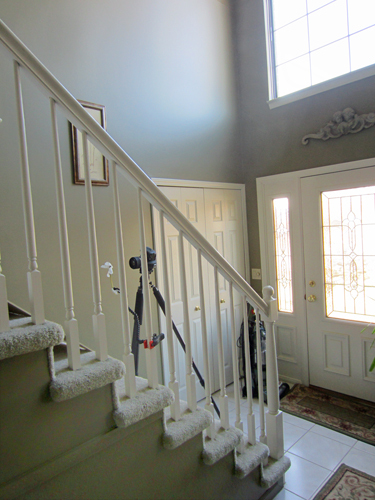 LOL, nothing fancy, it's just the stairway in the foyer. The large window on top floods the area with really nice even light. I used the natural light and no LED lighting on these images. I have my plamp used for holding the flower. Shooting with my Tamron SP 60mm Macro. 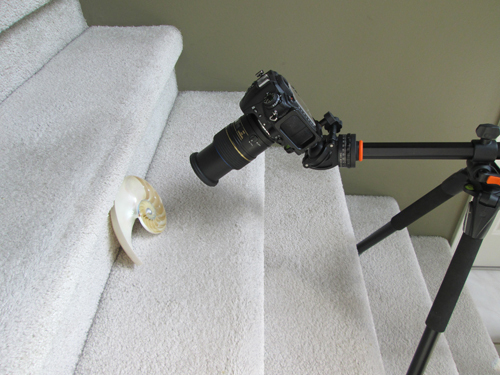 I like using the short focal length in the house as I need to work close on the stairway. I varied the f/stops shooting wide open at f/2.0 for a soft look and then at f/22 for more depth of field. I ended up liking the full depth of field images best. Here is the first image with no processing. This is an image I posted on Facebook and many commented thinking it was done with lighting. This look is from the "Solarization" filter in Nik Software Color Efex Pro 4. I added a little of "Vignette Blur" filter around the edges. That's it, no special lighting. Here is another version of the same subject shot wide open at 2.5. Also with "Solarization" with different adjustments. I shot quite a few different angles and compositions, but these two I liked the best. Here is the original with no processing. I wanted to have one image with a nice bright white on white, so used the "High Key" filter in Nik Color Efex 4. With the second version I went back to the "Solarization" filter again and got a nice defined look.